September 19, 2017, 1:38 PM · Congratulations to the nine violinists and nine pianists named this week in the Zhuhai International Mozart Competition for Young Musicians! 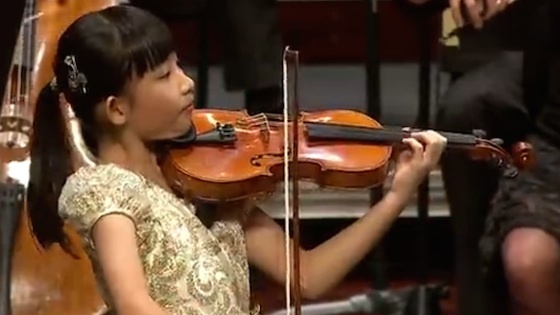 Violin finals are taking place this week and will be live-streamed; to find the live-streaming schedule and links, click here. Junior Division Finalist Chloe Chua, 10, of Singapore. Jury members for the violin section include Paul Roczek, Friedemann Eichhorn, Shmuel Ashkenasi, Harald Eggebrecht, Ani Schnarch, Akiko Tatsumi, Weidong Tong and Lina Yu. The competition is co-hosted by Zhuhai International Culture Association and the University Mozarteum Salzburg, Austria. September 20, 2017 at 02:40 PM · Either that violin is too big for that girl or this is really a viola competition. September 20, 2017 at 05:19 PM · Her hands look suitably large and her arms appear long to navigate that size instrument.